This is a guest post from David Greenberg. David shared some of his cheese making experiences with me, and, of course, I twisted his arm to contribute a guest article. Thanks, David! Let me first begin by thanking Andrew for the opportunity to be a guest contributor to his cheese making blog. I’ve only recently begun to make cheese and I think it’s great to be able to connect with others who have the same interest. For many years I've been an avid amateur bread baker, cook, and general foodie. I've long been interested in owning livestock, particularly dairy animals, despite having had only limited contact with them over the years. I figure that one day owning milk-producing animals will be a good way to combine my interests in animal husbandry, cooking and eating. This idea actually got its start about 15 years ago when I was a Peace Corps volunteer in Central Africa. I lived in a small rural community in the savanna where many people have dairy cattle. In the nearest large town, there was an international collective running a commercial dairy business producing milk, cheese, and ice cream. Their milk came from the many small dairy farmers in the surrounding rural communities. Every morning a 4-wheel drive truck drove the country roads picking up the metal canisters of milk (these trucks were great to hitch rides into town since they were MUCH faster than being stuffed into a bush taxi like a sardine for hours and hours). I naively thought that I could meet with the management of the dairy collective to teach me how to make cheese. I figured they would have the same “sustainable development” mentality I had to help the villagers improve their nutrition. As it turns out, profit-making collectives aren’t always interested in helping foreign aid workers and the villagers who supply them with cheap milk. So cheese making went on the back shelf. Recently, my interest in cheese has resurfaced and I decided it was time to learn more. Hours on the internet uncovered numerous websites with information about dairy animals, cheese making, and supplies needed. I purchased Ricki Carroll's Home Cheese Making book and was off and running. I've made several soft cheeses thus far including one semi-failed attempt at feta. One of the more successful cheeses I’ve made is a variant of a Ricotta Salata, or salted ricotta. I like this recipe because it is simple, doesn't require any fancy equipment, and you can age it in your fridge without need for an aging-cave. In my variant, during the aging process, I rubbed the outside with smoked paprika. The idea for this came from a similar style cheese I had found in one of the local hispanic groceries. 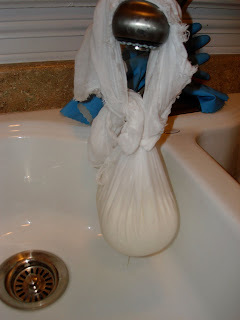 The basic, overall concept is to make a ricotta cheese, hang it to drain, salt it again, press it, and then age it. 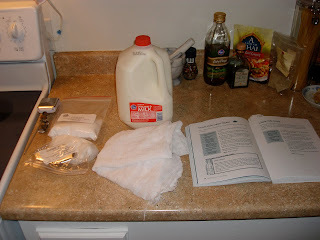 Add citric acid solution and ONE teaspoon of salt to milk. Stir. 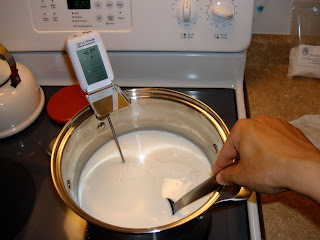 Heat milk, without boiling, to 185-195 degrees F. Do not allow to boil or scorch. Stir often. Raise temperature slowly. Be patient, this step takes time. Probably around 30-45 minutes. The curds and whey will begin to separate. Make sure there is no milky whey. There should be white curds and a somewhat clear fluid. When in doubt, keep gently stirring and wait another minute or two. Turn off heat. Line a colander with butter muslin. Ladle (don't pour) the curds into the muslin. Tie corners muslin and hang to drain for 30 minutes. I squeezed it a little initially to help express more fluid. I drained mine over the sink. If you want to make the salted ricotta, next is to salt it again. The original recipe calls for a second teaspoon of cheese salt to be mixed in. I did that. I personally think it was too much. In this recipe I'm recommending a 1/2 teaspoon of cheese salt, and frankly, I might even consider skipping this second salting. 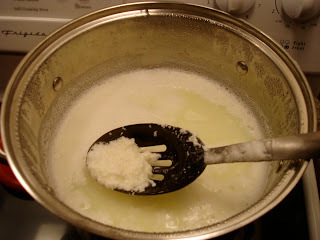 If adding the second round of salt, remove curds from muslin, add salt, and mix. 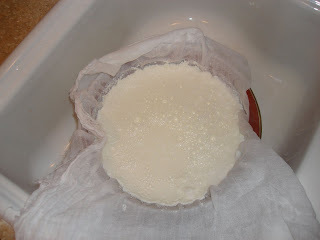 Put curds back into muslin, this time you can use single ply muslin. You want something just to help move the cheese around and hold its shape. 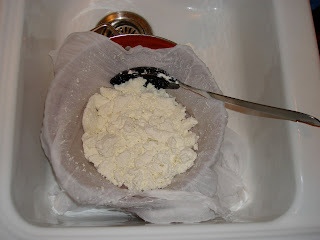 Place the cheese (within the single layer muslin) into the ricotta mold. I bunched up the excess muslin on top of the cheese, sticking out of the mold, so that the weight I put on top, would push down on the cheese within the mold. I used a heavy cast-iron pan. 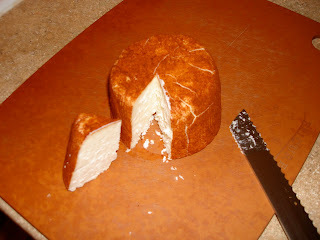 Unmold cheese. Turn upside down. Rewrap. Put back in mold. Press for 12 hours (in sink). Unmold cheese. Lightly rub outside of cheese, on all sides, with cheese salt. Cover and place in fridge. Once each day, lightly salt the outside of the cheese and turn it upside down. I ended up putting the cheese inside of a salad spinner so that it could drain. Not a lot of fluid comes out, but enough to make the bottom moist. Continue salting and turning for 7 days. On day 7, coat with paprika on all sides. Age for 2-4 weeks, turning every few days. 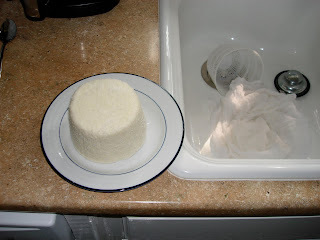 If any mold appears, use moist cheesecloth, dipped in salt water to gently remove. I personally found it hard to regulate moisture. Either condensation was forming on the inside of the lid/plastic wrap or fissures appeared as it dried out if I didn't cover it. Normal fridges aren't the best for aging. After about 3 weeks, I couldn't wait anymore and had to try it. The cheese was firm, crumbled a little, and had a very nice texture and taste. As I mentioned before, it was a little salty. The paprika on the edge of the cheese was fantastic. FYI, it didn't melt very well which is characteristic of this style of cheese. It is good for eating solo, chopped up on salads, or crumbled on mexican dishes. yummy! i have to try this one. milk delivered tomorrow. i'm french, living in japan, i want to make the Ricotta Salata, but i dont understand what is "Cheese Salt"
First, I'm sorry for taking so long to reply. You can use a variety of salt for cheese making, but you need to be sure it does NOT have Iodine added. (Iodized table salt is common in the United States to help prevent Iodine Deficiency). The Iodine will slow or kill the cultures in cheesemaking, so you definitely want to avoid that. Other than that, Cheese Salt is simply a finer salt (with flat crystals) that readily dissolves into the curds. You can use other salts, such as pickling salt or Kosher salt as well. I just made this ricotta salata, it is SO good. We have it on salads and I also put it over braised chard, yum! Thanks so much for this post. Thanks, G! Love the idea of putting it on braised chard. Sweet! i don't know if it has another name but in sicily after it has been aged and salted it is slowly baked, sun dried and baked again. so in the end it is a grating cheese used over any red sauce especially when combined with eggplant. I am Sicilian and I miss my "ricotta salata" so I will try this recipe. However, the real ricotta salata is made with sheep milk and not cow milk. Ever tried to make it with sheep milk? Try this to help regulate the moisture. I placed my plate with the cheese in the refrigerator but did not cover it with plastic wrap. Instead I inverted a bowl just slightly larger than the plate. I have metal refrigerator racks but I would assume placing it on a cooling rack if you have glass shelves would work. This allows for air circulation and I had no accumulation of moisture and no cracking of the cheese. Great recipe, thanks.